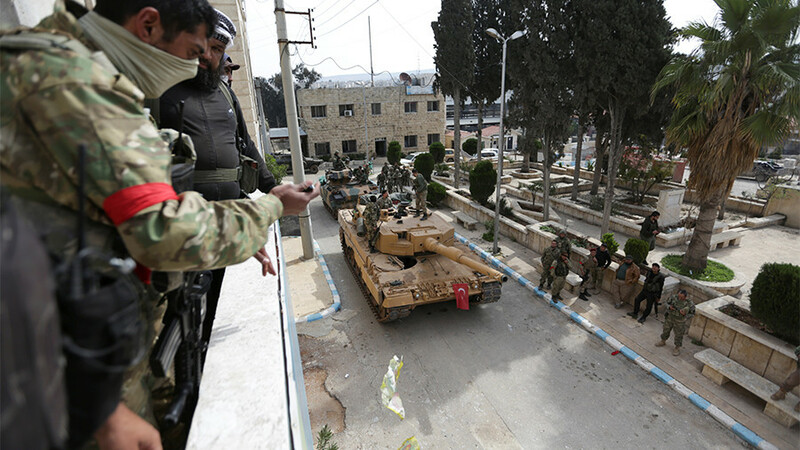 The Turkish military and allied forces have taken full control of the Syrian city of Afrin, President Recep Tayyip Erdogan announced on Sunday. Kurdish YPG forces had previously maintained control of the area. The pro-Turkish forces entered the city before dawn and faced no resistance from Kurdish fighters, who had already withdrawn, according to reports. Erdogan said in a televised speech this morning that all measures would be taken to protect Afrin’s residents. He praised the "heroic" actions of the armies, Turkey's NTV reports. Erdogan said that Turkey and its allies have not invaded Afrin, but rather “saved” the city from the “oppression” of terrorists. “This operation has shown the whole world that Turkey sides with the oppressed,” he said, as cited by Rudaw. The Turkish Army released a number of videos and photos reportedly from inside Afrin. The footage shows tanks rolling down the street, as soldiers wave Turkish and FSA flags. During his announcement, Erdogan made reference to past Ottoman military triumphs, comparing the Afrin operation to the Turkish defense of Gallipoli during World War I. “We are fighting the same way we did in Canakkale," he said, using the Turkish name for the historic battle. "They thought that Turkey is not as strong as it was in Canakkale." Coincidentally, March 18 marks the start of the ill-fated Allied assault on the Dardanelles in 1915. Kurdish officials deny that they have abandoned Afrin, however. Hediye Yusuf, a founding member of the self-declared Democratic Federal System of Northern Syria, said that Kurdish fighters left the city as part of an effort to safely evacuate civilians from what he termed a "massacre" by pro-Turkish forces. According to Rudaw, Mustafa Bali, a former spokesperson for the SDF, said that "the resistance in Afrin is entering a new phase and will continue." Turkish Defense Minister Nurettin Canikli praised Turkey’s “hero” army. Writing on Twitter, Canikli said that Turkish forces in Syria guarantee “peace, security and peace” for Turkey and the region. Kahraman ordumuz, dün olduğu gibi bugün de ülkemiz ve bölge ülkeleri için huzur, güvenlik ve barışın teminatı olmaya devam etmektedir. The Turkish operation was conducted in coordination with the Free Syrian Army (FSA). 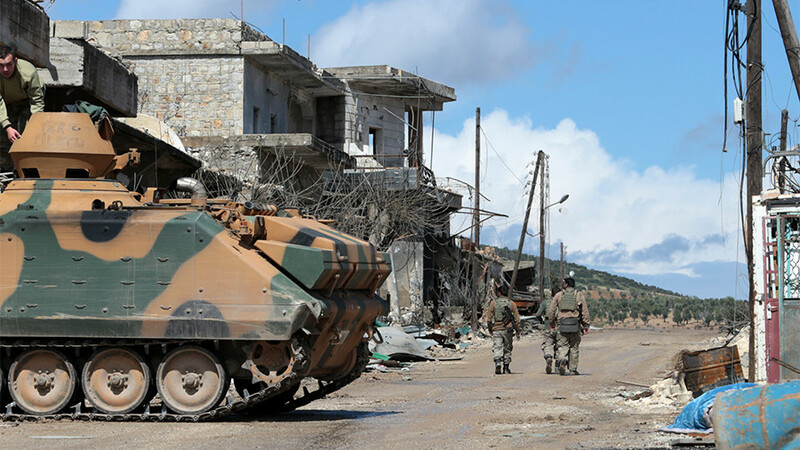 FSA fighters encountered improvised explosive devices (IEDs) as they entered the city, Turkish state media Anadolu Agency reported. Anadolu has released video and photographs allegedly showing a large munitions depot that has been seized by pro-Turkish forces in the city. On January 20, Turkey launched a cross-border offensive into Syria, with the aim to dislodge Kurdish “terrorists” from Afrin. The assault, codenamed Operation Olive Branch, has strained relations between Ankara and Washington. The Kurdish YPG are key US allies in the fight against Islamic State (IS, formerly ISIS), but Ankara views them as an offshoot of the terrorist-designated Kurdistan Workers’ Party (PKK). Pres. @RT_Erdogan pledges return of Afrin refugees and stabilization of the city including humanitarian and infrastructural support by Turkey. Kurdish forces claimed earlier this week that Turkey’s bombardment of the city had forced 10,000 civilians to flee their homes over the course of two days. On Thursday, Turkey dismissed a non-binding resolution approved by the European Parliament that called for a halt to Ankara’s military offensive in northern Syria, saying it demonstrated “clear support” for militants. 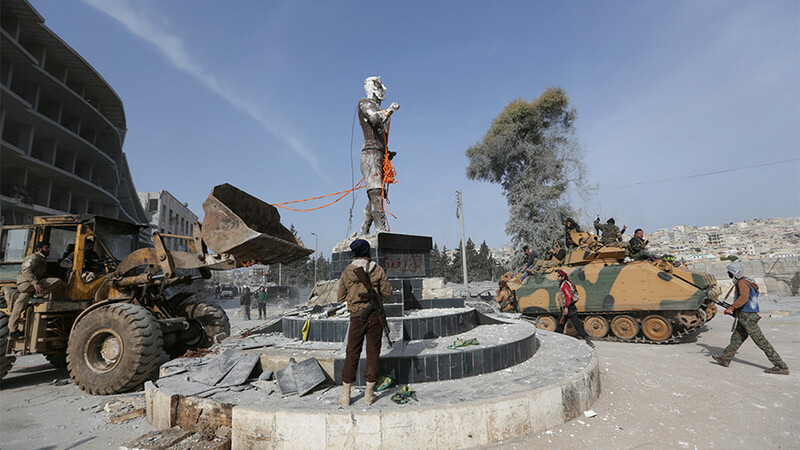 Photos purporting to show FSA fighters tearing down a statue of a blacksmith named Kawa, a central figure in a Kurdish legend, have angered Kurdish forces. A statement on a Whatsapp group run by the Kurdish-dominated Syrian Democratic Forces described it as the "first blatant violation of Kurdish people's culture and history since the takeover of Afrin," Reuters reports.